Ok so with this trick you might actually be ‘found out’ when you go to stand up!!! However it is still a great little trick if you want a gimmick at your lunch table. The trick involves you rubbing the coin on your forearm until it disappears, however the real trick is when you pretend to drop the coin and you discretely slide the coin and drop the coin in your lap. Once you then attempt to stand up you just have to make sure you remember the coin is there, maybe you could extend the trick and pretend the coin worked it’s way through your body and came out the bottom of your foot? 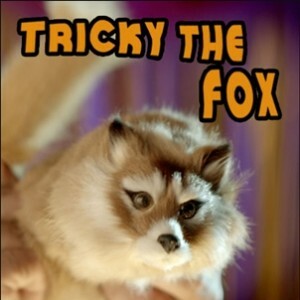 The key to making Tricky the Fox come alive is all about your handling. The special design of this Fox allows for the most life like performances… Included with your Fox is a teaching DVD. You will learn a variety of tricks and moves that will keep your audience laughing! Tricky will eat fromyour hand, scurry up your body, kiss on the cheek, bite your finger,dance around and more! Box not included at this time.